Everyone knows who Ken Wright is, right? 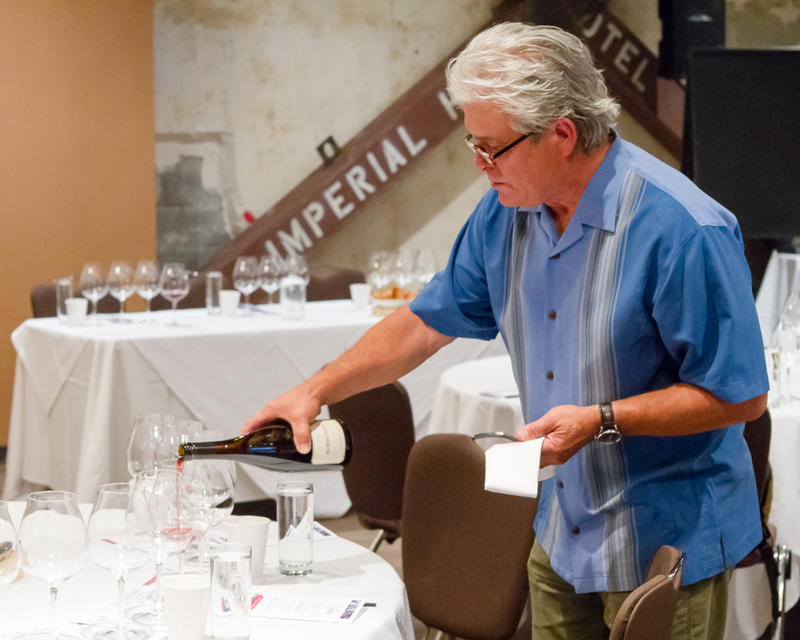 Cover of Wine Spectator May 2015, founder of Panther Creek Cellars and Ken Wright Cellars, one of the major advocates for the recognition of six distinct AVAs within the Willamette Valley. He is even from Kentucky. Boy I knew I liked him for some reason. He lost his accent, but everyone has room for improvement. But did you know the first wine Ken sold in Oregon was illegal? After working as a winemaker in California, Ken and his family set off for McMinnville, Oregon to start their own label. He had 10 barrels of Cabernet Sauvignon and Merlot that he had made in California. Well, “they loaded up the truck” and brought them along. They would serve as the start of his Oregon wine business. He set up shop in a “funky warehouse” for $250 a month. “You could see through the floors,” Ken recalls. The representative from BATF – they made house calls then – came and Ken was hoping for a green light. Ken showed off all of this nice equipment and not so nice space and then proudly said, “Here is some awesome wine from Mt. Eden to start my label.” Ruh- roh. Ken had forgotten about state laws and had accidentally illegally transferred wine across state lines. He would have been out of business before he was in business had the representative not taken pity on him and petitioned his supervisors to make a one time exception. It was still uphill to become the Ken Wright we know today. For five years he worked three jobs: winemaker, consulting winemaker, and of course waiter. He recalls the first winemaker’s dinner for Panther Creek Cellars. “We only had one wine so we served it for all six courses.” He was eventually able to move out of the funky warehouse and bought an entire block of McMinnville. Back then it cost $100K. Humble beginnings can be inspiring. 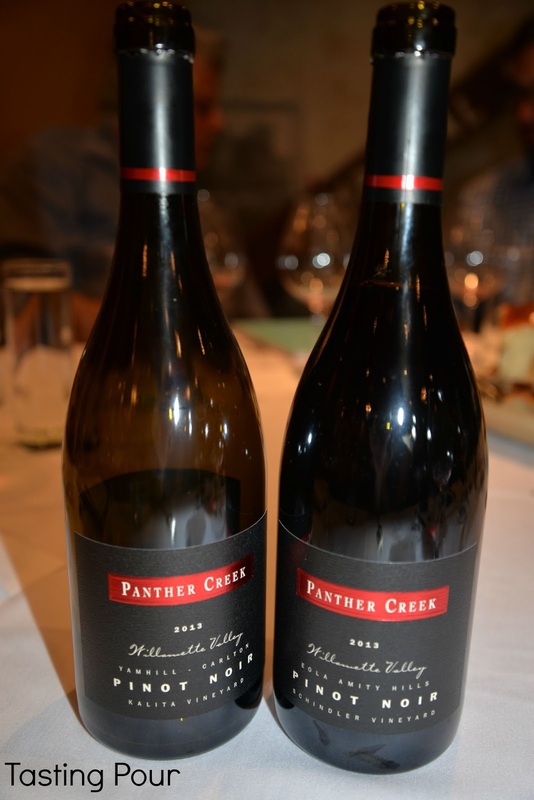 I recently joined Ken to celebrate Panther Creek Cellars Past and Present. It was exciting to see where this winery is headed. A new consulting winemaker, Tony Rynders, has joined the Panther Creek team and plans to revive the single vineyard designates program. Our group tasted three of the newest Panther Creek releases – 2013 Pinot Noir from single vineyards Carter, Kalita, and Schindler. Carter was one of the original vineyards supplying grapes to Panther Creek but it has been years since the winery sourced this fruit. 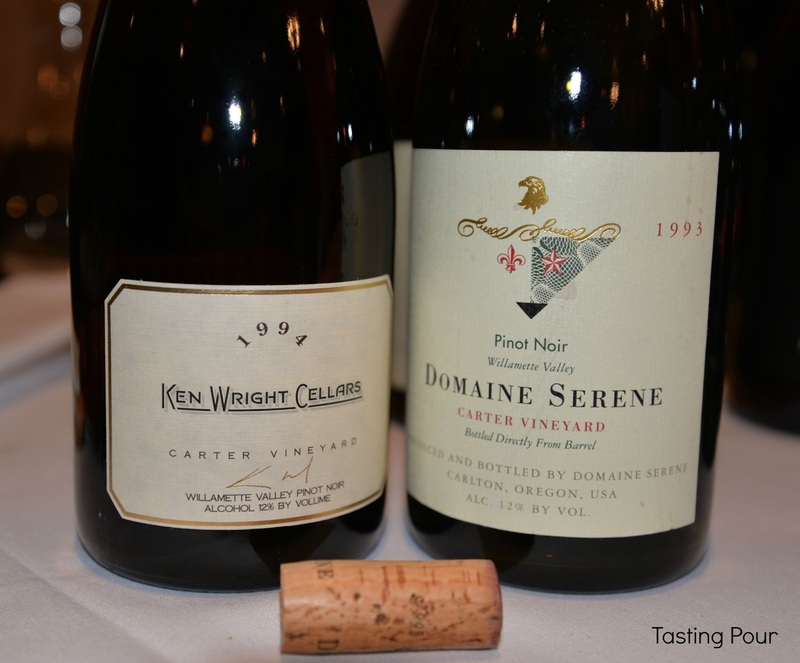 As a special treat we tasted two library wines from this vineyard – 1993 Domaine Serene Carter Vineyard Pinot Noir and 1994 Ken Wright Cellars Carter Vineyard Pinot Noir. The vibrancy and complexity of these wines made me want to cry and will stand out as one of my pinnacle tasting experiences in Oregon. And in true Oregon fashion, Ken will buy Carter Vineyard this month. Ken explains, “The Carters could have gotten more money on the open market but could not imagine selling to someone else.” You can’t beat the camaraderie of the Oregon winemaking community. I left with a bottle of the Panther Creek 2013 Carter Pinot Noir and the 2013 Columbia Valley French Creek Vineyard Chardonnay. There were no library wines left to swipe. 😉 More on how we paired these wines later.